Etheldreda’s monastery flourished for 200 years until it was destroyed by the Danes. It was refounded as a Benedictine community in 970. 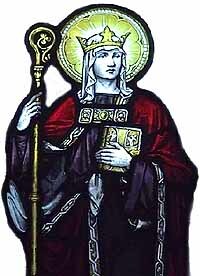 Etheldreda died c.680 from a tumour on the neck, reputedly as a divine punishment for her vanity in wearing necklaces in her younger days; in reality it was the result of the plague which also killed several of her nuns, many of whom were her sisters or nieces. At St Audrey’s Fair necklaces of silk and lace were sold, often of very inferior quality, hence the derivation of the word tawdry from St Audrey. For centuries, Etheldreda’s shrine was the focus for vast numbers of medieval pilgrims. It was destroyed in 1541, but a slate in the Cathedral marks the spot where it stood. The Archangel Gabriel announced that Elizabeth would have a son. Saint John the Baptist came to prepare the ways of the Lord. In Rome the devotion to St. John centers around the Lateran Basilica where Pope Hilary had erected two oratories, one in honor of St. John the Evangelist and the other in honor of St. John the Baptist. These two oratories became so famous that they gave the name of St. John to the Lateran Basilica itself. The greatness of St. John the Baptist consists entirely in his mission of preparing the way for Jesus Christ. Therefore he did not live for himself, but for Christ and for His greater glory. This is genuine humility, the foundation of all true greatness before God. Thou hast loved justice and hated iniquity: therefore God, thy God, hath anointed thee with the oil of gladness above thy fellows. Ps. My heart hath uttered a good word: I speak my works to the King. Glory be to the Father. Eternal God, who bestowed such grace upon your servant Etheldreda that she gave herself wholly to the life of prayer and to the service of your true religion: grant that we, like her, may so live our lives on earth seeking your kingdom that by your guiding we may be joined to the glorious fellowship of your saints; through Jesus Christ your Son our Lord, who is alive and reigns with you, in the unity of the Holy Spirit, one God, now and for ever. R.Amen. Grant, we beseech Thee, O almighty God, that Thy household may walk in the way of salvation and, by following the exhortations of blessed John the Precursor, may safely come unto Him Whom he foretold, even Our Lord Jesus Christ, Thy Son, Who with Thee liveth and reigneth in the unity of the Holy Ghost, God, world without end. R.Amen. the jealousy of God. For I have espoused you to one husband, that I may present you as a chaste virgin to Christ. With thy comeliness and thy beauty set out, proceed prosperously, and reign. Because of truth, and meekness, and justice: and thy right hand shall conduct thee wonderfully. Alleluia, alleluia. After her shall virgins be brought to the king: her neighbours shall be brought to thee with gladness. Alleluia. In Christ’s holy rule to stay. At that time, Jesus spoke to His disciples this parable: The kingdom of Heaven shall be like to ten virgins, who taking their lamps went out to meet the bridegroom and the bride. And five of them were foolish, and five wise: but the five foolish having taken their lamps, did not take oil with them: but the wise took oil in their vessels with the lamps. And the bridegroom tarrying, they all slumbered and slept. And at midnight there was a cry made: Behold the bridegroom cometh, go ye forth to meet him. Then all those virgins arose and trimmed their lamps. And the foolish said to the wise: Give us of your oil, for our lamps are gone out. The wise answered, saying: Lest perhaps there be not enough for us and for you, go ye rather to them that sell, and buy for yourselves. Now whilst they went to buy, the bridegroom came: and they that were ready went in with him to the marriage, and the door was shut. But at last came also the other virgins, saying: Lord, Lord, open to us. But he answering, said: Amen I say to you, I know you not. Watch ye therefore, because you know not the day nor the hour. May the offering of Thy consecrated people be accepted by Thee, O Lord, in honour of Thy Saints, by whose merits it knoweth that it hath received aid in time of trouble. Through the same Jesus Christ, thy Son, Our Lord, Who liveth and reigneth with thee in the unity of the Holy Ghost, God, world without end. R. Amen. Make holy the sacrificial gifts we offer, O Lord, and by the new birth of Your only-egotten Son, cleanse us from the stains of our sins. Through the same Jesus Christ, thy Son, Our Lord, Who liveth and reigneth with thee in the unity of the Holy Ghost, God, world without end. R. Amen. The five wise virgins took oil in their vessels with the lamps: and at midnight there was a cry made: Behold the Bridegroom cometh: go ye forth to meet Christ the Lord. .
Thou hast filled Thy household, O Lord, with sacred gifts; ever comfort us, we beseech Thee, through her intercession whose festival we celebrate. Through the same Lord Jesus Christ, Who livest and reignest, with God the Father, in the unity of the Holy Ghost, one God world without end. R. Amen. In the days of Herod, king of Judea, there was a certain priest named Zachary, of the course of Abia; and his wife was of the daughters of Aaron, and her name was Elizabeth. Both were just before God, walking blamelessly in all the commandments and ordinances of the Lord. But they had no son, for Elizabeth was barren, and they were both advanced in years. 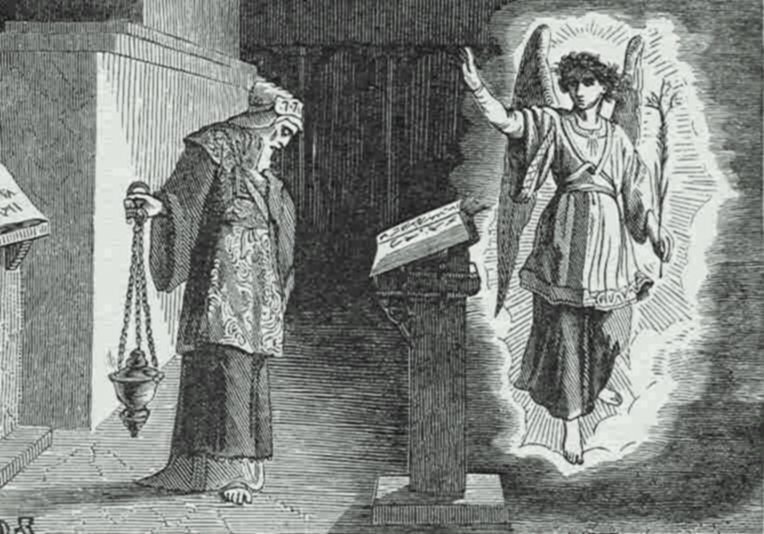 Now it came to pass, while he was officiating in the order of his course as priest before God, according to the custom of the priest’s office, that he was chosen by lot to enter the temple of the Lord to burn incense. And the whole multitude of the people were praying outside at the hour of incense. And there appeared to him an angel of the Lord, standing at the right of the altar of incense. And Zachary, seeing him, was troubled, and fear fell upon him. But the angel said to him, Do not be afraid, Zachary, for your petition has been heard, and your wife Elizabeth shall bear you a son and you shall call his name John. And you shall have joy and gladness, and many will rejoice at his birth. For he shall be great before the Lord; he shall drink no wine or strong drink, and shall be filled with the Holy Spirit even from his mother’s womb. And he shall bring back to the Lord their God many of the children of Israel, and he shall himself go before Him in the spirit and power of Elias, to turn the hearts of fathers to their children and the incredulous to the wisdom of the just; to prepare for the Lord a perfect people.